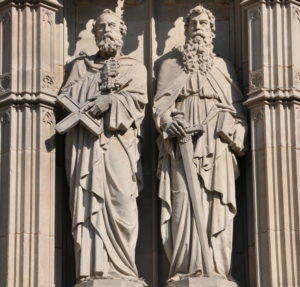 Christian devotion to Saints Peter and Paul is of a most ancient origin. The special Solemnity of Saints Peter and Paul has always been celebrated in Rome, at least since the reign of the emperor Constantine. Some Roman catacombs from this time period possess graffiti asking for the prayers of these great saints. One scribbled inscription reads, “Paul and Peter, make intercession for Victor”. On June 29, every year, Catholics around the world also ask for the intercession of these saints before our Lord’s throne. But as many great saints do, these apostles have nicknames. St. Peter is often called the “Prince of the Apostles” while St. Paul is typically called the “Apostle to the Gentiles”. While we celebrate both men on the same day, they both played different roles in the life of the early Church. Of course, we all know full well that St. Peter was the rock upon which Christ founded his Church. While he preached the gospel to many different peoples as St. Paul did, it’s clear that his main role in the life of the Church is an ecclesial one. As the first pope, it’s very fitting that St. Peter is called the “Prince of the Apostles”. Keep in mind that he isn’t a prince in the same way the Prince of England is. Instead, the word “prince” comes from the Latin princeps, which simply means “supreme head” or “ruler”. As Christ’s vicar on earth, he and his successors have been given temporal authority, and the power to “bind and loose” as our Lord said. We see this with St. Peter presiding over the Council of Jerusalem in the Acts of the Apostles. As for St. Paul, we see that he clearly traveled a little bit more than St. Peter. Just take a look inside any Bible from the middle of the twentieth century and you’ll more often than not find a map detailing St. Paul’s travels from Corinth to Galatia. Because he made so many contacts, it’s most fitting that we commemorate him as the “Apostle to the Gentiles”. Keep in mind that it was also him who rebuked St. Peter during the controversy stemming from whether or not Gentiles needed to be circumcised. Whenever one reads any of St. Paul’s letters, it’s pretty clear that he’s driving home the point that salvation comes through Jesus Christ, not through works of the Torah. But what’s beautiful about this special solemnity is that we focus on two specific roles of the Church. One role of the Church is to govern. That’s why we have the Magisterium. It ensures us that we are living in God’s truth. When all the bishops are united with the pope, we can be assured that a certain teaching is true. We were promised this certitude by Jesus himself before he ascended into heaven. This is embodied in St. Peter, and it really is comforting to know that no matter what, the gates of hell will never prevail against this Church that Jesus founded. It is continually the pillar and bulwark of truth. And then on the other hand, the Church is meant to go out to others. Since we are the Church, the members of Christ the Head, we have a duty to go out and spread the gospel message. We may not all have as much success as St. Paul did, but that doesn’t mean we have to stop trying. Don’t we live in a world that has become largely “Gentile”? That is, a world that really doesn’t know God much at all? Our world is much like the one that Saints Peter and Paul lived in. There’s a lot of work to do here in the twenty-first century in regards to building the kingdom of God. But it’s not impossible. If these two great apostles could do so much on their own, just think what 200, or even 2,000 Catholics with a similar mindset could do! Like St. Paul, we need to be an apostle to the “Gentiles” of our age, and like St. Peter, we need to stand firmly on the “rock” upon which Jesus founded his Church. 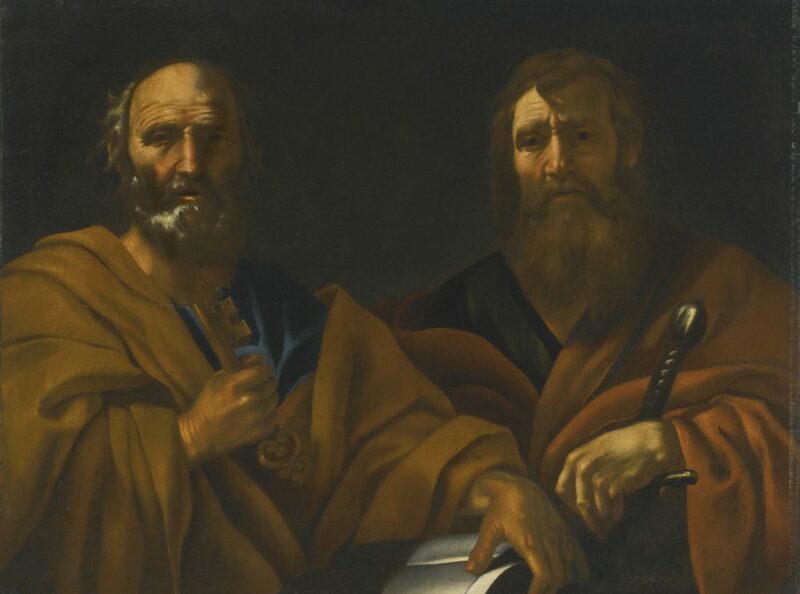 If there’s anything to take from this week’s solemnity, it’s that each and every one of us Catholics are called to do what St. Peter and St. Paul were called to do. If we haven’t really answered that call yet, now is a perfect time to resolve ourselves to do so. Embeded image by Josep Bracons on Flickr. Why Follow the Rules When You Can Follow Your Heart?